Our mission is to remove trash, graffiti, and anything foreign to the environment from outdoor recreation and wilderness areas while enriching the lives of Military Veterans and other community members. Our vision is to keep natural areas clean and open to the public. We remove trash, graffiti and anything foreign to the environment from outdoor recreation and wilderness areas throughout the state of Arizona. We provide contract work to Military Veterans on our Dedicated Restoration Team and host volunteer events for the community, including youth volunteers. We have a passion for nature and we believe outdoor restorations and education ensures everyone will be able to enjoy outdoor recreation and wilderness areas. We approach every project with a commitment to long-term change and making lasting impacts in communities across the state. Click HERE for completed volunteer restorations. We launched our Dedicated Restoration Team in February 2017 and contracted Military Veterans to work on our team. Our Dedicated Restoration Team works throughout the year to restore areas around the state that see continual dumping, areas too remote for volunteers, areas that are spread out over more than a few miles, and natural areas with graffiti. In 2017, our team removed 69 tons of trash and over 600 square feet of graffiti through a grant from the OHV-Fund managed by the Arizona State Parks Board. 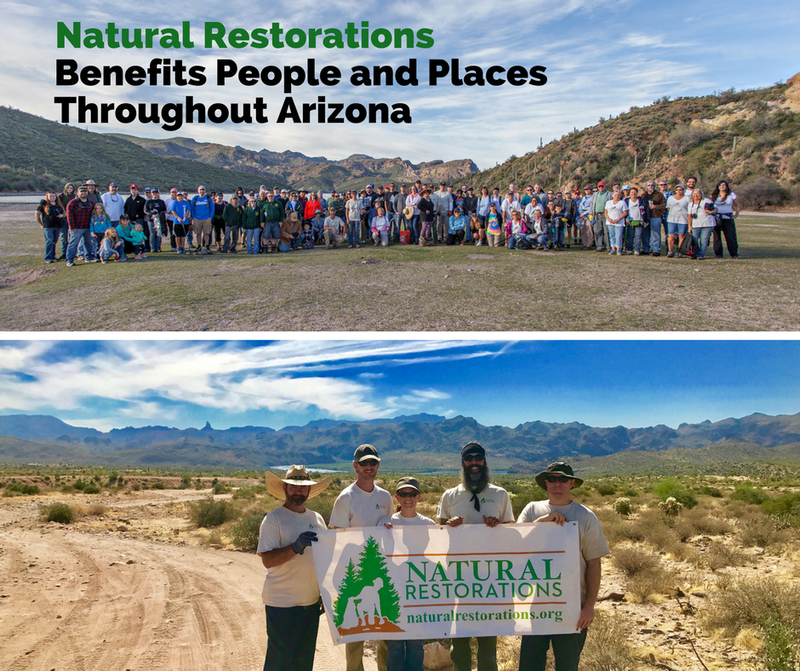 In addition to site restorations, we are dedicated to educating youth and adults on the importance of caring for and restoring natural areas. We provide hands-on activities that encourage lifelong environmental stewardship, volunteerism, and team building for youth, families, and communities across the state. Join us at our next event, click the button below to register. Provide contract work to Military Veterans on our Dedicated Restoration Team. Prevent outdoor recreation and wilderness areas from being closed to the public through restoration and education. Increase public awareness and educate for responsible recreation. Provide youth with hands-on service learning opportunities. Teach children and adults how they can preserve natural areas for future generations. Leave as minimal a footprint as possible on all restorations. Inspire public participation in environmental cleanup activities. Bring various outdoor recreation groups together for a common cause. Provide opportunities for low-income youth and youth who for whatever reason have not built a connection with nature, a chance to enjoy the great outdoors without seeing it littered with trash. Natural Restorations Recognized by U.S. Forest Service. Natural Restorations is a 501(c)(3) nonprofit organization making all donations tax deductible under 501(c)(3) Federal EIN 81-4745055. Donations can be submitted online via PayPal or by mailing a check payable Natural Restorations to 67 S. Higley Road, STE 103-118, Gilbert, AZ 85296.